Askonas co-developed one of the first systems for the cloning of antibody-forming B cells in vivo, some of the earliest monoclonal antibodies. She was also one of the first scientists to isolate and clone virus specific T lymphocytes, laying the foundation for defining different influenza sub-sets and improving vaccines. The daughter of Czech parents, Brigitte Askonas, widely known as Ita, was born in Vienna. Aged 15, Askonas fled with her family from Vienna in March 1938 shortly after the Anschluss that united Austria with Germany. The family settlied in Canada in 1940. Both Askonas's father and brother owned knitting mills in several European countries and her mother, a graduate in fine arts, was an art collector. From an early age Askonas had an interest in languages, art, literature, nature and biological books as well as classical music, but until mid-way through university had little idea what career she wanted to pursue. Askonas spent two years at Wellesley College, Massachusetts and then attended McGill University, Montreal, from which she graduated in biochemistry in 1944. She was then inspired by David Lansboroough Thomas, Professor of Biochemistry and Dean of Science at McGill University ,to pursue a doctorate. 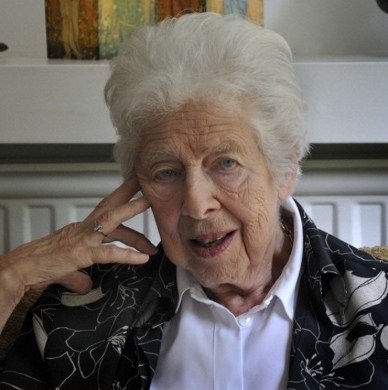 This she began at the School of Biochemistry at Cambridge University in 1949 under the supervision of Malcolm Dixon. She completed her doctorate in 1952, having worked on muscle enzymes. During her time in the department she came into contact with Margaret Stephenson and Dorothy Needham, who were among the first four women to be elected to the Royal Society. They taught her that good science gets recognition regardless of the gender of the scientist. Before undertaking her doctorate, Askonas worked at the Allan Memorial Institute of Psychiatry, associated with McGill University. Her project was to study the biochemistry of dementia. In 1952 Askonas joined the National Institute for Medical Research where she worked for 36 years, the last of them as head of the immunology division. Her initial work at the Institute was on the biosynthesis of milk proteins. This work inspired her to investigate the origin and synthesis of antibodies and to study the role of macrophages. Subsequently she worked on the role of T-lymphocytes in infection, especially those connected with influenza and respiratory syncytial viruses, a disease that afflicts infants. In 1973 Askonas was elected as a member to the Royal Society based on the contributions she made to the understanding of the origin and synthesis of antibodies. One of her major achievements, was the cloning of memory-B cells in vivo with Brian Wright and Alan Williamson. These cells represented some of the first monoclonal antibodies ever produced. Her work also clarified the role of macrophages and T cells in the immune system's defence against infections, laying the foundation for understanding how T lymphocytes detect foreign invaders in the body. Askonas's research also established the principle that cytolytic T cells, which kill cells infected with viruses, had the ability to recognise multiple subtypes of viruses. This contrasted antibodies which recognise a single virus subtype. The principle she established is today vital to the development of new vaccines against the infections that cause HIV/Aids, malaria, TB and pandemic influenza.